All the Schools in Thanjavur district under the control of Department of School Education and Elementary Education, are functioning as usual for the classes from 1st Standard to 12th Standard. The schools include Primary/Middle/High/Higher Secondary. For administrative purpose these schools are classified as Govt. (Municipal/Corporation, Adi Dravida Welfare, Social Welfare, Aided, Self finance, and Matriculation Schools. For all the High and Higher Secondary schools located in the revenue district of Thanjavur, the CEO is the administrative head and the three Educational districts of Thanjavur, Pattukkottai, Kumbakonam are functioning under the control of DEOs respectively. In Elementary Education, all the primary and Middle schools are functioning under the control of respective AEOs at the Union/Block level. 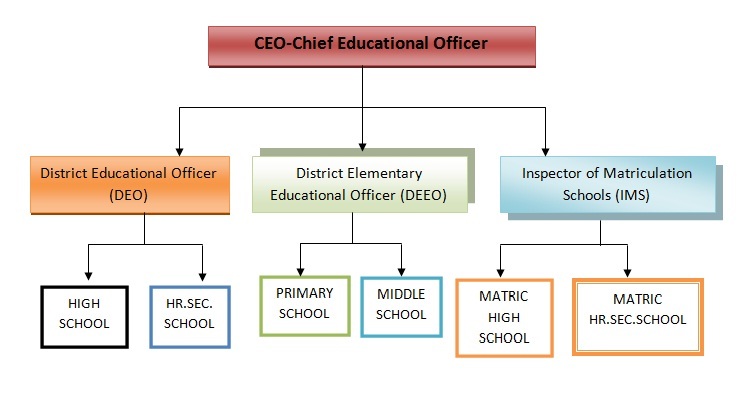 For these schools at the revenue district level, the DEEO is the controlling officer. All Matric schools are functioning in the revenue district of Thanjavur under the control of IMS. In Thanjavur Educational district, 281 Primary schools, 67 Middle schools , 59 High schools, 58 Higher secondary schools are functioning. In Pattukkottai Educational district, 461 Primary schools, 98 Middle schools , 90 High schools, 77 Higher secondary schools are functioning. In Kumbakonam Educational district, 379 Primary schools, 100 Middle schools , 53 High schools, 77 Higher secondary schools are functioning. In Thanjavur revenue district level, 1121 Primary schools, 265 Middle schools , 202 High schools, 212 Higher secondary schools are functioning under the control of ADW department. Under the Social welfare department, 1 Higher secondary school, 1 Deaf and Dump Higher secondary school( Special School) and 1 High school for Blind (Special School) located in Thanjavur town are functioning as usual. To ensure the quality education in our school the following steps are taken. The instructions from Department of School Education are strictly followed in our schools to make a complete learning environment with basic infrastructure. The Teachers underwent in service training to update the subject and teaching skills. Audio visual teaching methods with internet facilities are used (smart classes) in the schools. To make the learning easy, virtual class rooms (24 schools) are installed in our schools providing the students get live classes that are going on across the country (video conference). To improve the achievement, slow learning students are given extra coaching classes in the morning and evening. Modules with simplified subject content are given to slow learners. Vocational subjects are included in syllabus which helps the self employment and to select professional courses in higher studies. Coaching centers are opened for coaching the students to clear the NEET examination(15 Centres). Information about higher courses, professional courses and the higher institution are disclosed to students to get good opportunities after public examinations. The state and central government schemes are used to help and improve the education of the students. The students’ problems were determined and psychological counseling was given by professional psychologists and teachers. To avoid the mind distraction, library, sports, yoga, cultural, and co- curricular activities are offered to students. Under the sincere care of our Government, maximum Government schools are provided with sufficient building facilities and furniture’s. To ascertain the above standard as well as to enrich it, stability of buildings, periodical maintenance like white washing and painting the buildings, additional building are to be under taken by the respective PWD. Water facilities, potable water with RO system are fully equipped. To enhance healthy move, maintenance work as well as remedial measures, the schools which are not facilitated may be prioritized at the earliest. Hand washing process, waste water outlets, may be diverted towards garden available at premises with NGC. “Swach Bharat” project fulfills the need of toilets to schools and the amount allotted is sufficient to cater the materials as well as the salary for part time scavenger allotted by panchayats accordingly. Instead of part time employee, if a fulltime worker is appointed, the standard would be uplifted. Schools are provided with Napkin vending machines with incinerator for girls students. In addition, according to the strength of girls, additional electronic incinerator may be allotted to the schools. Presently, students are trained to dispose the disposable and undisposable wastes in the respective containers. Separate waste bins may be provided for disposal of plastic garbage’s and the same may be disposed by the local panchayats regularly under their supervision. Waste food materials may be heaped in a compost pit in a corner to convert the same as fertilizer and the above said project may be assigned as extracurricular activity. Apart from the medical care provided now like WIFS tablets (Albendazole) deworming tablets issuance, variety noon meals, medical inspection may be inducted, additionally identifying blood group of every student for authentication in school report. Imparting the importance of food awareness and avoidance of junk food must be strictly adhered by the concerned schools health clubs would be beneficial. Mobile library project is successfully on its move and the same may be added to rural schools as well. As a crown to all these facilities provided by our Tamilnadu Government. To keep up students health physically and mentally, Practice of Yoga and meditation may be inculcated for children’s by the trained teachers. During weekends, at least once in a month students may be permitted to enjoy it as “BOOK FREE DAY”, on that day children’s may be allowed to show cast their creative skills such as playing some skits, dance, drama, sharing their ideas, conducting parliament activities under the supervision of their respective class teachers. For successful implementation and to assist the above said activities like maintaining garden, watering, supervising the working of incinerators, store keeping the raw materials, purchasing the needs and to overall register maintenance, Every special, interested each may be provided with an office assistant and a watchman. To improve the artistic talents of school going children our government’s special scheme is properly implemented by giving “Crayons & Colour Pencils” to them in Thanjavur District 23,511 Crayons and 32,129 Colour Pencils to the students from (III std to V std in government high and higher secondary school) distributed. To improve the artistic talents of school going children our government’s special scheme is properly implemented by giving “Crayons & Colour Pencils” to them in Thanjavur District 38,226 Crayons and 11,010 Colour Pencils to the students from (I std to V std in government high and higher secondary school) will be distributed. To Carry the School Books & accessories our Thanjavur School Children were given 2,67,638 school Bags. To Carry the School Books & accessories our Thanjavur School Children were given 2,69,180 school Bags. In Thanjavur District, Schools, Atlas – Maps have to be distributed for the students of standard VI std Totally 25,805 maps will be distributed to the students. (VI std Only). Tamilnadu Education Department has launched Fifteen “Competitive Exam Coaching Centres” in Thanjavur district. In Thanjavur district presently 1168 students are being trained by the coaching centers from 56 schools. In those centers periodically tests are conducted to the students and ensure the quality and attainment. From the 15 centers we have allotted 3 centers exclusive for English medium students. The English Medium centers are mentioned below. Govt. Girls Higher Secondary School, Vallam. Govt. Girls Higher Secondary School, Kumbakonam. We took part in that process in term of conducting Feedback survey from students, according to the feedback students are very eager to participate in the coaching class, by the same time they are satisfied with the learning process too. Finally the “Thoduvanam” Project breaks economical barriers of poor students learning, In Thanjavur District 15 Training centres have been providing quality training to below mentioned below. Virtual Class rooms are activated in 24 Government Schools at Thanjavur District. This classes improve the teaching ability of the teachers and improve the learning ability of the students. The teachers who are handling the virtual class room they have been present their intelligent presentation through the virtual class room. It has been used to the students day to day life. Inspire Award for the academic year of 2016-17 & 2017-18 district level science Exhibition held on 02.02.2018. 37 Students were participated and exhibited their models. The best exhibitors were selected and the prizes were distributed for their best project. The best competitors had also been selected to participate in the State level Exhibition. Subjectwise 10 days In Service Training has been given for the High and Hr.Sec Schools teachers those who handle 9th and 10 th Standard . School Leadership Development Programme(SLDP) Training was given to Head masters for Ten Days. Yoga Training has been given for PET,NGC,NSS JRC Coordinators. 255 Teachers attented this training. There are 30 Govt . High and Hr .Sec schools in the district selected for implementing the ELCOM English Projects , 30 Govt . High and Hr .Sec schools in the district selected for implementing the STEM Science Projects and 30 Govt . High and Hr .Sec schools in the district selected for implementing the ARIAL Maths Projects. Each school has been provided Rs.15,000/- for the purchase of kits for the above projects. There are 10 schools selected for implementing RAA Scheme in the district . Selected 100 Students from each schools have participated and enjoyed the Exposure visit within the state. There are 100 Students from the projects schools have participated and enjoyed the Exposure visit outside the state. Inclusive Education for differently abled Children of 14 to 18 age group have been implementing the following activities promoted by RMSA. IEDSS Girls Stiffened Rs.2,000 and Rs.5,00 TA for both boys and girls. Provision of aids and appliances. 150 students have participated in the sports and the best performers were awarded with prizes and certificates. Through Tamilnadu RMSA Scheme 223 School Management and development Committee has formed in all type of Govt high and higher secondary Schools in our district. School Management and development Committee act as a bridge between the school and the society. The committee shares powers to all sections of people such as Headmaster, teachers , PTA Representative, elected members and social worker or NGOs worker . The committee has freedom to make resolutions about the development of school infrastructure, quality educations, Planning, implementation, monitoring and evaluation of all School Level activities. Encourage the children to participate in Sports, creative activities and national and State level talent test. Maintain the records for recurring and non recurring expenditure. Ensuring utility of Government welfare scheme to the children. using resources such as the usage of library books kit box, science kit box and other materials. Handling of school grants and maintenance grants. And also make the framework of using other funds. Preparing School Development plan and executed .